During the winter of 1610, the colonists consumed all of their dogs and horses in an attempt to survive. 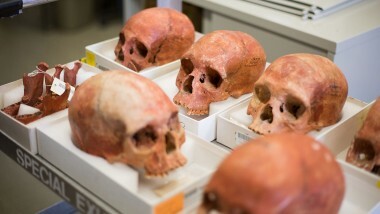 There were also reports of survival cannibalism from Jamestown that winter. The red X denotes the L-shaped kitchen/cellar where archaeologists made this gruesome discovery. Fill layers that yielded the horse and dog bones also revealed the mutilated skull (right) and severed leg bone of a young English female. 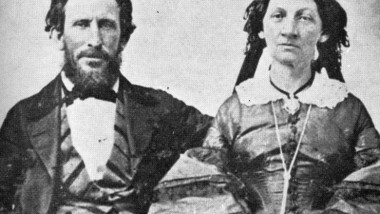 Forensic analysis of these bones demonstrated overwhelming scientific evidence that the young woman had been cannibalized. 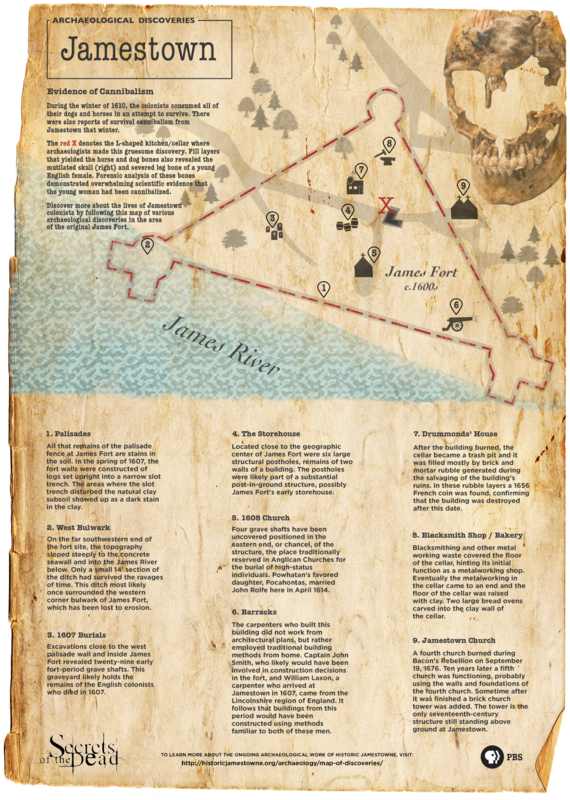 Discover more about the lives of Jamestown colonists by following this map of various archaeological discoveries in the area of the original James Fort. All that remains of the palisade fence at James Fort are stains in the soil. In the spring of 1607, the fort walls were constructed of logs set upright into a narrow slot trench. The areas where the slot trench disturbed the natural clay subsoil showed up as a dark stain in the clay. On the far southwestern end of the fort site, the topography sloped steeply to the concrete seawall and into the James River below. Only a small 14′ section of the ditch had survived the ravages of time. This ditch most likely once surrounded the western corner bulwark of James Fort, which has been lost to erosion. Excavations close to the west palisade wall and inside James Fort revealed twenty-nine early fort-period grave shafts. This graveyard likely holds the remains of the English colonists who died in 1607. Located close to the geographic center of James Fort were six large structural postholes, remains of two walls of a building. The postholes were likely part of a substantial post-in-ground structure, possibly James Fort’s early storehouse. Four grave shafts have been uncovered positioned in the eastern end, or chancel, of the structure, the place traditionally reserved in Anglican Churches for the burial of high-status individuals. Powhatan’s favored daughter, Pocahontas, married John Rolfe here in April 1614. The carpenters who built this building did not work from architectural plans, but rather employed traditional building methods from home. Captain John Smith, who likely would have been involved in construction decisions in the fort, and William Laxon, a carpenter who arrived at Jamestown in 1607, came from the Lincolnshire region of England. It follows that buildings from this period would have been constructed using methods familiar to both of these men. After the building burned, the cellar became a trash pit and it was filled mostly by brick and mortar rubble generated during the salvaging of the building’s ruins. In these rubble layers a 1656 French coin was found, confirming that the building was destroyed after this date. Blacksmithing and other metal working waste covered the floor of the cellar, hinting its initial function as a metalworking shop. Eventually the metalworking in the cellar came to an end and the floor of the cellar was raised with clay. Two large bread ovens carved into the clay wall of the cellar. A fourth church burned during Bacon’s Rebellion on September 19, 1676. Ten years later a fifth church was functioning, probably using the walls and foundations of the fourth church. Sometime after it was finished a brick church tower was added. The tower is the only seventeenth-century structure still standing above ground at Jamestown. 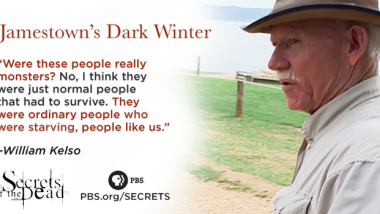 Secrets of the Dead: Jamestown’s Dark Winter premieres Tuesday, November 24 at 10 p.m. on PBS (check local listings).